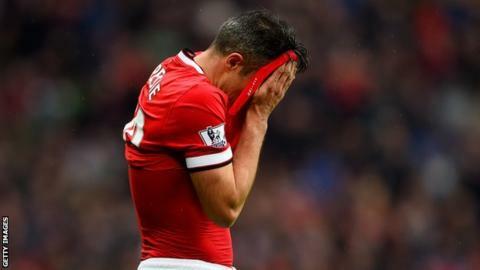 Manchester United manager Louis van Gaal has stripped Robin van Persie of penalty duties after Saturday's miss cost his side against West Brom. Asked if Van Persie would continue as first-choice penalty taker, Van Gaal said: "No. He is now at the end of the road." "It is always [the same]," he added. "Wayne Rooney has missed also, so when you miss, you are at the bottom again." West Brom's 1-0 victory was United's third league defeat in succession. Van Persie, 31, had the opportunity to equalise Chris Brunt's 63rd-minute opener from the spot after referee Anthony Taylor ruled Saido Berahino had handled in the box. But Baggies keeper Boaz Myhill guessed right and palmed the Dutchman's effort to safety, helping West Brom to a second straight win at Old Trafford.